My churchgoing experience has taught me that there are a couple of things to expect when entering a worship service. Some hold more appeal than others. -Firstly, there’s a greeting, which means standing up and shaking hands with people who forget to ask your name. -There are offering envelopes, which have real old pictures of church buildings on them. -You can also bet on church bulletins, which are full of useful information and potentially humorous misspellings or gaffes. Those bulletins also usually list “special music,” when the choir sings something a little more elaborate than a traditional hymn to the congregation. I’ve not typically been a fan of this element. The folks who sing are sweet people, and it’s good to have them share with the parishioners, but I’ve always thought the notion’s a little old fashioned. Like, 80’s old fashioned. That changed the other week. I couldn’t tell you the name of the song, and I couldn’t whistle the melody if I tried, but the special music had an acapella break that just jumped out and grabbed me. I actively thought about how cool it sounded. Then, extrapolated– how cool would it be to have that sort of song echoing a hundred, or a thousand, fold? Pieces began to fall into place. That… would be heaven. Truly. 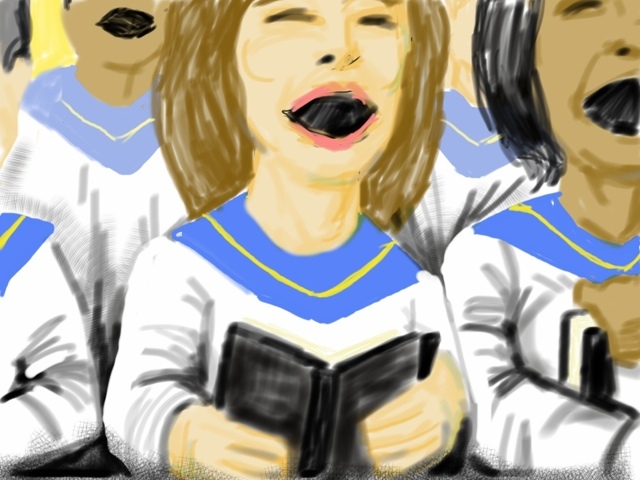 I used to envision that we’d be brought into the heavenly realms just to have a giant choir practice. Special music for all eternity. Oh boy. Instead, in a transcendent moment like that, I realized that heaven was probably going to be more like a musical play. We wouldn’t just stationed in place with elaborate robes on and bulky songbooks in our hands. I imagine it would be natural to do our business of eternal living among saints, The Lord, and friends, and just be moved enough by the wonder of it all to break into song. Think of a show like Glee (I watch it with my wife, okay?) Or, if you prefer, a 90’s Disney film, or a rock opera. We accept, cheesy as it seems, that the characters can break into a pop song to express the truth of what they are feeling at that exact moment. In the presence of God, with feelings alternating between gratitude, awe, and sheer exultation hitting us like surf, that’s the primary truth we’ll be experiencing. I bet we’d have the freedom to bust out in song. It won’t be choir practice. It’ll be a flash mob. Now, this isn’t directly scriptural. I’m speaking more from my present culture than anything else. Heck, I’m sure there WILL be some old school gospel choirs forming up. And watch out for the Gregorians, cause they’ll probably still be pilling on the chants. …get ready for the spontaneous anthems.